Update Note: This is my CURRENT 2016 plan until otherwise posted. I found so much success with it in 2015 that I'm continuing to follow it today. A few update notes have been added—but overall, this training plan works so well to keep me motivated, helps me work toward my running, racing & fitness goals, and fits nicely into my personal & work schedule—so it's here to stay! It's no secret that running & fitness have become a major staple in my life. It's turned from a way to stay healthy into a hobby that I put a lot of energy and experimentation into—finding out what works best for me and produces the greatest return. With several recent competitive races under my belt and times that are dropping with each race (I took 16-minutes off my half marathon personal best time in less than 4-months—going from 1:33:09 down to 1:17:23 and (update as of 10/27/15) I have also dropped my full marathon time from 4:03 to 3:06:58), I've been getting a lot of questions about what training plan I'm following and how I'm achieving these results. In an effort to be as up-to-date and helpful as possible, I'll try to give as much detail as I can! I'm still following the same plan I was using back in May, which included the Hal Higdon Half Marathon Training Program (Update: as of December 2015, I'm using his "Marathon 3" program) for running and the Kayla Itsines Bikini Body Guide (BBG) for strength training. I've tweaked the programs slightly—increasing the times and intensity of my workouts—but nothing drastic. Here's a breakdown of my current plan, which I have scheduled out for the duration of 2015 (Update: and now until further notice for 2016). Overview: (Update: as of December 2015, I'm using his "Marathon 3" program, and besides for the actual program itself, all training details still apply.) I'm following a modified version of Hal Higdon's Advanced Half Marathon Training Program—which I used for both my half and my full marathon training. While his program calls for 6-days of running a week, I find that if I overtrain to that extent, I injure easily—so I revised his program. I simply pulled his Tuesday, Thursday and Sunday run schedule and put it into my plan. I figured that it included a speed day (speed, sprints or hills), a tempo day, and a long run. Note: as of December 2015, I'm using his "Marathon 3" program. Tuesday Run Days: I do the listed speed workout, performing the intervals at a 6:00/mile pace (which I aim for as a "race pace"). So if it's 400 repeats, each speed lap is run at 1:30. If it's hill repeats, I pick a roughly quarter-mile hill and sprint up it for 1:30. If it's 1600 repeats, I run each mile with a goal of a 6:00/mile. No matter what the speed interval is for the day, I aim to run for 60-minutes. It typically ends up being about a 30-minute workout, so I tack on a 15-minute warm-up and cool-down to achieve the full 60-minutes. I like Thursdays because whether I perform the suggested tempo run or instead to run based on how I feel that day, it typically ends up being a relatively quick pace. Tempo runs start you out with a jog for the first 1/4, build to a decent speed for the middle 1/2, and slow you down to a recovery jog for the last 1/4. Some days my body doesn't feel up to a tempo run (since the middle 1/2 is usually pretty fast), so I'll just run at whatever pace feels good that day. Sometimes it's a 10:00/mile, other times it's a 7:00/mile. I always run the suggested time he lists, though if I have extra time left over until I reach the full 60-minutes of my desired run time, I'll do a little extra recovery jog and/or walk at the end. While I typically go for my long runs on Sundays before church, I do interchange them with Saturdays on occasion. With the Advanced Half program, the long runs don't specify a distance to run, they only specify how long to run, so the length of my long runs vary based on my pace for the day. If I'm feeling on or if the schedule calls for it, it will be a faster run, usually under 8:00/mile pace. If I'm just running to get the long run over with and don't feel on point that day, it will typically be a slower run, averaging 9:00-10:00/miles. Overview: I'm currently on BBG 2.0, Kayla's second 12-week workout series. I saw great results from BBG 1.0, and continue to see increased strength and decreased body fat as I make my way through BBG 2.0. Once I finish with this guide, I plan on going back and starting BBG 1.0 again. 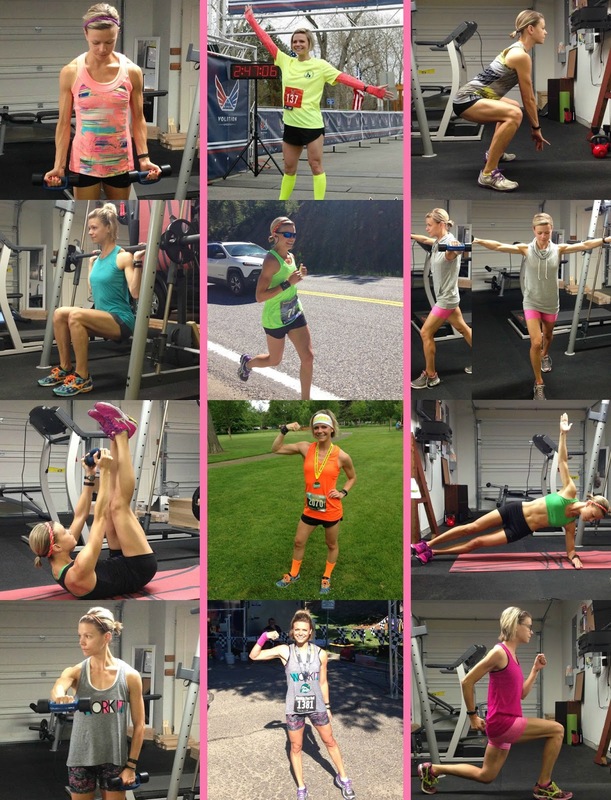 Strength Days: Kayla's workouts are typically 28-minutes long from start to finish if you do not rest in between. I always perform a 15-minute warm-up and 15-minute cool down. Sometimes I will do them on the treadmill, other times I'll go outside for a quick walk around the block. Occasionally I'll also throw in a couple additional weighted strength exercises at the end of my workout if it's a body part I'm working on and didn't feel like it was integrated very much that day (i.e. deadlifts on lower body day or bicep curls on upper body day). As I am doing the BBG with my running training, I often have days where I'm sore from either the strength training or the running (like after race days or long runs). I do modify exercises in the BBG based on how my body feels. For instance, I don't do bench jumps or anything leg-related a couple days before a race. Likewise, I typically am unable to do things like squats or plyos for a few days after a race as my body is just too tired and sore. It happens. Challenge Days: One difference from BBG 1.0 to BBG 2.0 is that 2.0 often has full-body or Challenge Saturday workouts, whereas 1.0 only had workouts on Monday, Wednesdays and Fridays. I try to fit these Challenge or full-body workouts in, but don't always succeed. I really enjoy doing them, so if I am unable to do them, I'll often tack the Challenges on to a regular strength day (like core day) or fit them in after a run. Cross Training Days: On the Saturdays where a Challenge or additional workout is not listed, I'll take it easy and opt for more of an "active rest" day. This usually involves a bike ride, rowing session at the gym, walk around the neighborhood, etc. Some days it's just a simple foam rolling & stretching session. It doesn't really matter, as long as I move a little bit that day. Overview: Whether I get in my workout or not, I try to aim for a 20-30 minute lunch break walk each day at work. I typically eat lunch at my desk, working while I eat, and take my "lunch" sometime in the afternoon. Not only does it get me out of the office and away from my desk, but it helps clear my head, reduces my stress, and slightly elevates my heart rate. Its just the active rest I need during the day to re-fuel my tank. While this feels like a super-specific breakdown of my training and—to be honest—probably seems a little over the top, I'm hoping it will help answer some of the more workout specific questions that might come up. People often want to know how I balance getting these workouts in with my free & professional time, and this is it. For me, it's all about moderation. If it feels good that day—I'm all in. If it hurts—no way, baby—rest is a good thing. And hey, sometimes fitting in that day's training may mean getting up at 4:00 am to be on the road running by 4:20. For me—it's worth it. I'm super open about this topic & love to talk about it. If you have questions, please don't hesitate to leave them in the comments below. I'm not a certified personal trainer or dietitian, so I can't give specific advice, but I'm happy to answer questions based on my own personal experience.